An advantage of the new pension reforms in April 2015 is to have full access to your pension savings. The obvious disadvantage however is the potentially large income tax bill. 25% will be allowed tax free still, however any of the additional 75% withdrawn will be added to your income tax bill for the year. Those with larger pension funds therefore face a choice. Take it all out and pay higher rate tax (40%) and potentially additional rate tax (45%) on some of the income or withdraw it over a number of years. The current income tax thresholds are as follows. Therefore any pension fund withdrawn above £41,865 (assuming no other taxable income in the year) will be charged at 40% and additionally at £150,000. Clearly this wouldn’t be the most tax efficient way of withdrawing funds so what are the alternative options? This is where consideration needs to be taken. If the sole intention is to withdraw funds as quick as possible but stay below certain tax thresholds, care should be given to the choice of investment vehicle. Income drawdown has traditionally been an investment based product, and as any good financial adviser will tell you, investments should be considered for a minimum of 5 years. Therefore if your fund size is such that you’ll depleate it before this time frame, the usual investment based approach may be risky. Investments fluctuate in the short term (up to 5 years). If there is a particularly uncertain period in the stock markets the 5 years after you retire, the value of your pot may be seriously depleted. The advantage of holding investment over the medium to long term should allow for short term fluctuations to be ironed out. 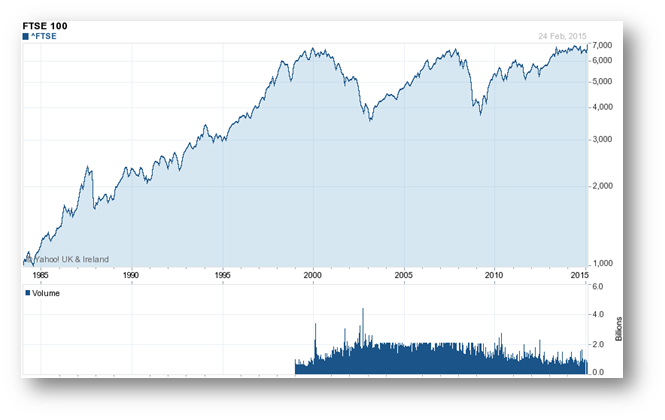 Look at this chart of the FTSE 100 since 1985. This highlights the general growth over the medium to long term. However, there are short term periods of massive decline. The year 2001 to 2003 and the more recent crash of 2007/08. Although pension freedom wasn’t available during these periods anyone with a FTSE 100 fund, who may have adopted a short term withdrawal strategy during this time, would have seen the value of their funds almost half. Note that following these periods however in the medium term the markets ‘bounced back’. Although this chart solely illustrates the FTSE 100, global markets followed a similar pattern. An investment based approach with a large equity content could therefore be a risky strategy. The other alternative is to use the flexibilities income drawdown provides, but choose a more cautious approach. Funds that contain a higher weighting to perceived ‘less risky’ asset classes like gilts and bonds could be one method, however are still exposed to volatility. This chart from monevator.com shows the volatility of the main asset classes taking into consideration inflation. 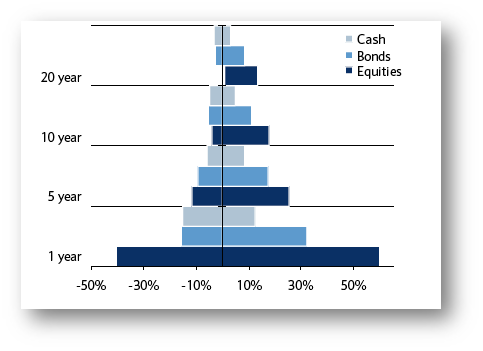 It highlights that the least volatile asset class in the short term is cash. If you are wanting to withdraw a similar amount to your starting fund value this is the most likely option. Cash based drawdown is available through many providers, either in a Deposit Based fund or Money Market funds which can provide a slightly better performance but are a step up in volatility. Cash doesn’t carry investment risk but does carry inflationary risk meaning the real spending power of it will decrease over time if the interest rate isn’t as high as the increase in the cost of living, usually measured by the Consumer Price Index. Consideration therefore is paramount when deciding which type of investment your remaining drawdown fund should be placed into. 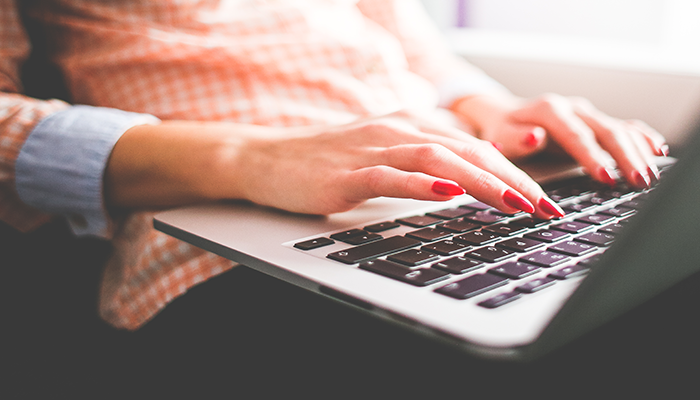 If you are taking financial advice make the withdrawal period clear to your adviser. If you are choosing to set up and manage a drawdown plan yourself, carefully consider the volatility of your chosen investment against the time period of withdrawal.